The following is a testimony from Elizabeth Coleman who is the Inspector General of the Federal Reserve. She is in charge of overseeing the Fed's actions. Please view with caution, the following video is both shocking and tragic. Jim Cramer, CNBC's star figure, for months has called the housing market to bottom in June of 2009. He has stuck by his forecast, and fully expects prices to stop falling from here and to begin rising. He is not alone. The new mantra across the media, as well as what I'm hearing in the real market is that we are approaching a bottom. 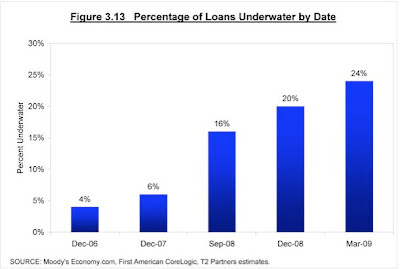 As you can see we are approaching the end of the subprime loan disaster. 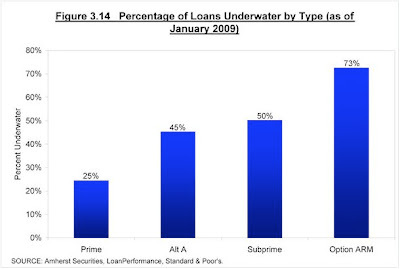 However, subprime was only one type of exotic loan that was released during the housing mania. Another, which is far more deadly, is the option arm loan. I have discussed this in the past, but the option arm gives the home owner an "option" of how he will pay every month. One of the options is to pay less than the full interest payment and add principle to the loan amount every month. 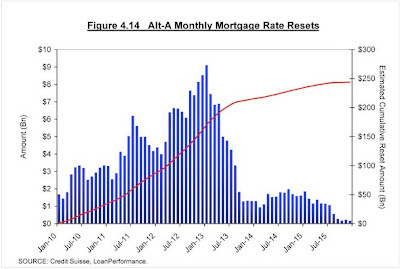 When these loans reset, their default rates are shockingly high. The first graph above showed the subprime loan resets coming to an end. The resets will continue to fall through the end of this year. Then we start the second wave of loan resets, the option arm resets, which begin this fall and run through 2013. 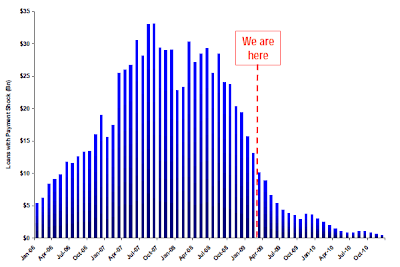 This wave will be even bigger than the subprime wave. Every month, more and more homeowners move closer to being underwater on the value of their home. When a homeowner goes underwater it is far more likely that he will give up making the payments and send the bank his keys. This pushes prices down further, pushing more homeowners underwater. As this continues, many prime loans will find themselves owing more on their mortgage than their home is worth. They too will begin sending in their keys. The real unemployment (used before rule calculation changes in 1990's) has just crossed 20%. Have home prices hit the bottom? I'm going to continue renting. I'm going to bet against the great Jim Cramer because I think I can get a better price next month, and the month after. In December of 2006 Peter Schiff explained to Fox News the impact of upcoming adjustable rate loans on our housing market. He was ridiculed and laughed at. Home prices have since fallen off a cliff and the market has been decimated. This morning, 3 years later, Peter Schiff explained to a guest on CNBC that our country's debt is financed with short term financing. It has been financed with one huge adjustable rate loan. He is one again told that he doesn't understand the situation and that everything is going to be okay.